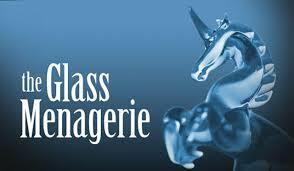 If you love theater, chances are you have already seen a rendition of The Glass Menagerie by Tennessee Williams. However, it is always a pleasure to see this four-character memory play that first opened way back in 1944. In case you haven’t seen it, you are missing out on a great play and need to get tickets right away. The Glass Menagerie opens in a Wingfield apartment in St. Louis, where the mother Amanda lives with her crippled daughter, Laura, and working son, Tom. It is the 1940s, and Tom is explaining to us that the play is his memory (1930s) being re-told and is full of quirky memory elements such as strange lighting and music. The father is absent, as he “happily” abandoned them years ago. A large screen is also brought in front of the audience that is used to project images and pictures as the play unfolds. Tom is having dinner with his family, when Amanda asks Laura to look nice and pretty for her “gentlemen callers” but her daughter doesn’t have callers and neither does she expect any. It is implied that Amanda had callers when she lived in the South, so she wishes the same for Laura. Her daughter describes a boy named Jim she used to have a thing for in high school, and it is here that we see her glass menagerie obsession. Amanda seems annoyed at Laura due to her overly shy nature, due to which she dropped out of a typing class. Things aren’t much better between mother and son too as he is forced into doing a job he hates and wants to leave, but he can’t do so because of his obligation to support his family financially. The ever-dominating matriarch calls him selfish for constant reading, dancing, drinking, and escaping to the movies. The end moments culminate in a kaleidoscope of events – Amanda asks Tom to get a gentleman caller for Laura, who turns out to be her old crush, Jim. The women are excited, but Laura hides in the living room till Jim gets her to open up and talk freely. A kiss happens, but he is engaged and takes off, leaving Laura sad and Amanda seething with rage, as she feels her son played a trick on them. Tom follows in his father’s footsteps and leaves his family. The past merges with the present, as he says it has been 10 years, even though he is unable to forget his sister. Please make sure you book tickets early to avoid disappointment!